I am happy to welcome Carrie Green to my Blog as my first TeaserTrain participant. TeaserTrain is a new vehicle to give Teasers a larger reach. 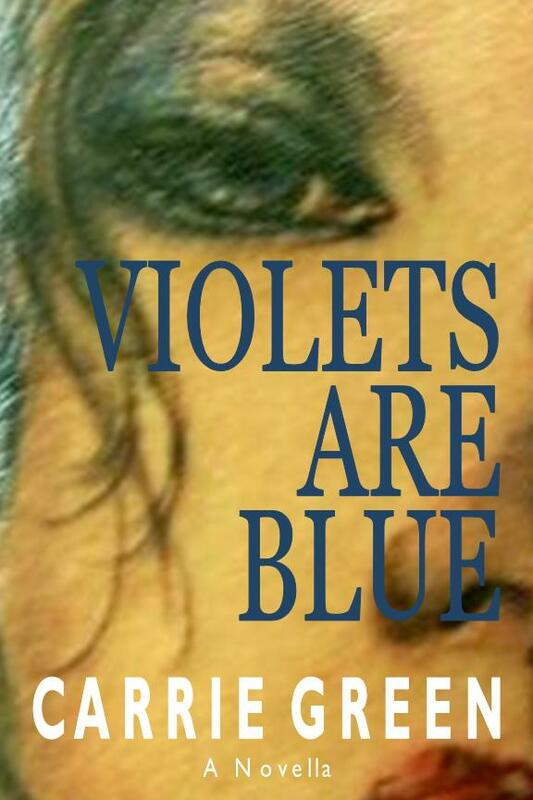 She is posting a Teaser from my novel “The One That Got Away” while I am posting a Teaser from her novella “Violets Are Blue”. Contact me if you are interested in participating in TeaserTrain. Newly-wed Sarah was delighted to move in with her mother-in-law, Martha, a widower who had raised her son, by herself, on an isolated Midwest farm. It never occurred to Sarah that Martha may see her as completion, to be eliminated. Sarah stood on the dirt road, staring at the six foot high stalks, at the long, rippled leaves that concealed, in seconds, the bold red of Todd’s t-shirt. The corn had swallowed him up. She hadn’t expected him to take off. Seriously, he wanted to play tag in a corn field? Then, she thought, why not? It was as crazy as anything else that they had done together. She remembered the time that they had walked through a snow storm, licking ice cream cones. People drove by, laughing at them, but a cone in winter had the advantage of not melting. It was the perfect weather for ice cream. “Come and get me!” he shouted, but she heard him moving again as she ran into the field, the noise of him running was fainter than the crashing of her own elbows and legs through the corn stalks. In the corner of her eye she saw the ears of corn which were both uglier and smaller than those in the supermarkets back home. The cobs, half eaten by the birds, had empty black sockets that resembled gap-toothed smiles. Tassels draped over the cobs like a bad comb-over. The leaves sliced her skin. She was forced to run through random swarming circles of flies. Her hands were held out straight in front of her, in a futile effort to protect her face. Sarah could hear Todd, up-ahead. He sounded closer. She stumbled. Her feet kept getting caught in the rope-like webbing of the corn roots. The ground was rock hard and dry. Only her momentum kept her from actually falling. A glimpse, finally, of Todd’s shirt; she was gaining on him. Grinning, she gasped for more air, she was getting closer. Todd was too smug in his country boy superiority, condescending about her fear of chickens. They were big birds, peaking at her knees, chasing her around the pen. They had flapped their useless wings in what she figured was their attack pose and made their warning cries, high and screechy. Fried chicken. Roasted chicken. Sweet and sour chicken. Her revenge would be tasty. Todd was no longer a blur, but begun to take shape, again. She could see, in clear detail, the dark wave of hair at the top of his neck, formed by his constant habit of wearing baseball caps. She was getting closer. Growing up in Chicago didn’t mean that she couldn’t run. There had been plenty of things to run from in Chicago. She liked to think that four years in college hadn’t slowed her down. She could see Todd turn his head to check on her progress. He started quarterback dodging, going left and then right, around the rows of corn. Sarah followed, replicating his sudden turns. She steadied herself by reaching out at the corn, ripping off leaves, knocking down stalks. She was beginning to enjoy herself, exhilarated by the pounding of her heart and the heat of the sun on her head. I loved all the imagery in here and I could totally see myself running through those fields of corn. Great teaser. Great excerpt, Carrie! Thanks for hosting, Kellianne! TeaserTrain rocks! Intrigued, I do want to know what happens after this. Nothing good, I take it? Great! Thanks for the sample, interested and really like this writing style, clear, descriptive and pulling me into the story ahead. I agree that Carrie has an awesome teaser here! Her style is excellent.